Within 250 miles of Oconomowoc, WI. This swim clinic focuses on the most often overlooked areas of your swimmer’s stroke that will enable them to improve their efficiency! We specifically selected visually impaired Paralympic gold medalist Tucker Dupree to work with participants so that they can get a deeper appreciation for what the strokes FEEL like when swum at a high level. Each session will have a specially designed curriculum for that specific age group and will be taught by Paralympic medalist Tucker Dupree! Blast off the blocks, into underwater dolphin kick, and breakout ahead of the competition at this swim clinic designed to help competitive swimmers age 11 & Under improve upon the key details that are essential to swimming fast and improving their times. Paralympic medalist Tucker Dupree will teach all participants the drills that they need to practice to master these skills. Starts: Get off the blocks faster and with more speed and power by learning the techniques of Tucker Dupree! Your swimmer will learn to set up on the blocks in a position that will allow them to explode forward. Make sure to be fuly engaged in the air as you throw your hands forward into a tight streamline. Your swimmer will learn drills and exercises that will help make them faster at this clinic! Underwater Dolphin Kicking: The fastest swimmers in the world dolphin kick off of their walls and breakout ahead of the competition. It's not as hard as you think. Tucker will help swimmers improve their technqiue as well as commit to a number of kicks off of every wall so that they can imporve their underwaters now as well as in the future. Get ahead of the competition at this High Performance Swim Clinic focusing on teaching you the proper technique for faster walls in your IM races. Work with Paralympian Tucker Dupree to learn the drills and skills you need to be able to improve on these challenging and athletic skills! Flip Turns: Learn to carry your momentum through the turn to get ahead of the competition every wall. Tucker is a World Record Holder due to his discipline and focus when executing a proper flip turn. Practice drills and exercises to help you flip faster and blast through every turn! Open Turns: The open turn is often done incorrectly. Extra movements are added in that slow swimmers down. Keep it simple by spinning backwards and keeping your elbows in close. If you listen closely to Tucker; he will show you how he became one of the the fastest swimmers in the country through the turn. 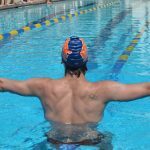 IM Transitions: There are several different ways to transition from backstroke to breaststroke in your IM races. Learn each option and figure out which one is best for you so that you can drop time in your IM races! Swimmers and parents are invited to ask Tucker questions during a Q&A session. Gain insight into his training regimen, diet and nutrition, and recovery tactics. Learn about how he lost 80% of his vision and overcame this challenge to become a Paralympic medalist and World Record Holder!